This super-premium blend is the fourth vintage, and the best yet. Corfu is extra smooth with lots of structure allowing for a very long life. This wine is made cleanly from triple hand sorted fruit. All Georgos wines are handcrafted in small batches with premium, imported and sustainable fruit with no added sugar and low sulfites. This wine is named for the ancient Greek island (circa 1,300 BC) of Corfu, the second largest of the Ionian Islands, and Siren, the dangerous yet beautiful creatures, who lured nearby sailors with their enchanting music and voices to shipwreck on the rocky coast of their island. Corfu is made from hand-picked and triple hand sorted fruit. 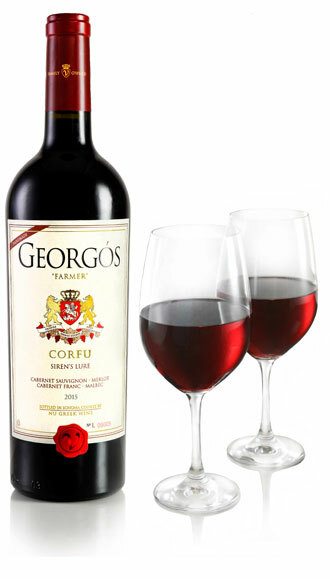 Like all Georgos Super-Premium Greek wines, this wine is Handcrafted with low sulfites and no additives. We use organic production methods and we aged it almost one year in the barrel for extra smoothness. Simply delicious! It is gently low pressure pressed. We use about 35% new oak, 55% from France, 20% from Hungary and 25% from Pennsylvania forests. While aging, the wine is tasted and tested regularly and the barrels topped every three weeks. We bottle the wine when we taste that it is ready, not before. This is the fourth vintage, and the best so far. The blend is constructed by taste. Not what the wine tastes like but where you taste it, each varietal focusing on a particular part of the palate. The blend will vary from vintage to vintage but the style and character remains the same. Corfu will enchant you as well. Great food is a blend of flavors, textures and aromas. Great wine is the same. Cabernet Sauvignon forms the base, like the rock and soil of the island, Cabernet Franc gives lift, like the blue Mediterranean sky, Malbec adds allure, like the island architecture. Merlot, enchantment, like the island lifestyle. Every sip is like a soirée on Corfu.